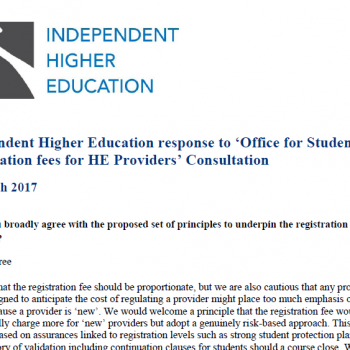 This blog by IHE Chief Executive, Alex Proudfoot, was first published on the Wonkhe website. New providers are not the barbarians at the gates of our higher education sector. They are the inventors in our labs, questioning past paradigms. They are the artists in our studios, mixing ancient craft with new inspiration. They are the chefs in our kitchens, turning familiar ingredients into unique recipes all their own. The new providers of 2017 may be bolder than any of those which came before. The rapid advance of technology in the last 25 years has caught the whole world by surprise. The quantum leap in accessibility of information triggered by the internet is not yet complete and its impact still far from understood. Our relationship with work continues to evolve in ways which undermine past certainties about professions and personal career development. Boldness today may be the only prudent course. The Higher Education and Research Bill is a bold piece of legislation. It has to be if it is to make a mark in such mercurial times. But while it responds to recent transformations in kind, it is no more the cause of them than it is able to reverse them. That would be a heavy burden to place on any law. What is true is that in the 25 years since the last major piece of legislation, the landscape of higher education has changed beyond the recognition of its most loyal defenders. A wave of new polytechnic and metropolitan universities has washed away memories of a leafy campus far from the ills of the modern world where quiet contemplation and intellectual pursuits abound. But higher education in the UK can no longer be the preserve of a narrow cross-section of society. The changes in our economy and Britain’s place in the world demand a highly skilled and flexible workforce of the kind shaped by higher academic and technical education. As the pool of talent requiring this education expands, so too must the options available. One size does not fit all. Some critics of the Bill say that a free market in higher education alone can never deliver the diversity and innovation that we all know our growing student population needs. No one ever claimed that it would. But it is remarkable how many employers and entrepreneurs have in recent years taken it upon themselves to explore new models of provision to fill the gaps they found, from the Condé Nast College of Fashion and Design to Sotheby’s Institute of Art, from the Dyson Institute of Technology to the Academy of Contemporary Music, from UCFB at the Wembley and Etihad stadiums to the New College of the Humanities in traditional Bloomsbury. These institutions have faced a long and winding road to enter the market and establish themselves. How many more like them would we encourage with a more transparent and streamlined system of regulation fit for modern times? The Bill will unlock the answer to this question. It will also give the government a better foundation and the right tools to make its own interventions in the market where further encouragement is needed. This may well come in the form of innovative public-private partnerships such as Hereford’s New Model in Technology and Engineering or Ada College, the national college for digital skills. The Bill will support these interventions with a regulator which is agile, empowered and intelligent in weighing risk. This is a critical point. Regulation is best performed by a suitably powerful and independent regulator, advised by experts in the field. This is precisely what is proposed by the government in the Office for Students – a truly modern regulator, designed from the start for the sector of today and ready for the challenges of tomorrow, guided by the critical expert advice of an independent quality body such as QAA. The sector has already slipped away from the regulatory model of university title and direct degree awards. Today there are more colleges, institutes and schools delivering degrees awarded by a partner than there are those who award their own. The growth of validation was a stop-gap response to a rise in education providers keen to offer degrees to an increasing number of students who want them. We will not turn back this tide – not the sector, not the government, and not Parliament – but we can act to ensure that it works as well as possible for students, universities and the new providers driving these innovative programmes. The Bill is a long-awaited and essential opportunity for regulation to catch up with a practice which to date has been largely unregulated by government or any of its agencies. This state of affairs may suit a few universities enjoying their quasi-regulatory role as gatekeepers to the sector, but most recognise that validation is to all intents and purposes a regulatory process, entirely appropriate for the regulator to oversee. The reason why validating universities have taken this burden of responsibility on themselves is simply as a means of managing risk in their academic partnerships. It is not their natural role or their natural priority to validate other institutions any more than it is their natural role to pioneer new courses or create new industry-based teaching partnerships. Their focus on academic standards rooted in their established disciplines is understandable and commendable, but should not prevent others from creating provision which is more responsive to particular industries or skills needs. It is right that the Office for Students has the power to assume this regulatory burden itself, allowing bilateral validation arrangements between institutions to focus on what matters most, the learning experience of students and the development of an academic community. A single, streamlined but rigorous gateway process for new providers is the vision we hope to articulate through our collaborative project with the Open University and QAA, who together comprise the sector’s experts in this area. We believe that a strong regulator with broad powers to carry out the necessary due diligence on new entrants and minimise the risk involved in validation will not prevent or discourage new academic partnerships; it will support them all the better. 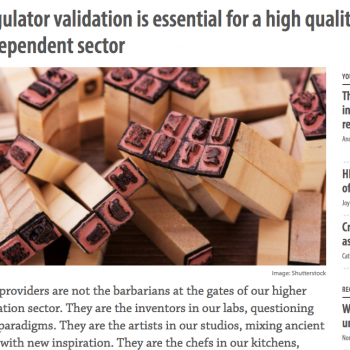 With the gateway checks carried out by the regulator and designated quality body, validation is transformed into a positive choice for new providers, not a hurdle they have to jump over. It will remain the first choice for those who require the institutional apprenticeship it provides – those without the essential experience of designing both programmes and quality assurance processes in a higher education context. But where a provider is ostensibly new to the UK sector but is in fact led by individuals with precisely this experience, and where they can satisfy both the OfS and the quality body of their academic credentials and sustainable plans for growth, surely it is right that they can enter the sector in a controlled and managed way – under strict monitoring but without the delays inherent in navigating the internal processes of another institution who may add nothing of their own to the quality or currency of the new courses offered? The DAPs and validation powers are inextricably linked. Each process needs the other. The OfS should be empowered to press ahead with regulation which better supports validation, but it must have the necessary tools itself should universities be unwilling to embrace this change. Validation today is a risky process, where universities can withdraw from partnerships with scant notice, leaving students without the degree they came for. The OfS must be able to step in and protect students in these cases. This is why the ‘validator of last resort’ provision in the Bill is so vital: it is not about the OfS ‘competing’ with universities in the ‘validation market’, but about recognising the essential regulatory function of validation, and giving the OfS a clear legal power to ensure that this activity is undertaken in a way which protects the interests of students at new providers and those on collaborative degrees. And where validation is not the most appropriate route, the OfS needs the power to identify this and provide an alternative route for these providers. The bar for Degree Awarding Powers after the Bill must be just as high as it is now. Institutions applying for Probationary DAPs must clearly show their ability to establish and judge degrees against the accepted standards, and to develop and deliver new programmes within the UK’s qualifications frameworks. It would be naive, however, to believe that validation is the only way to achieve this, and we must not shackle our new modern regulator to an old way of regulating which was itself an accident of history. We must simply ensure that it has the right processes and people in place to make the right decisions for students today. The major amendments to the Bill tabled last month by the government reassure me that this will be the case. The importance of expert advice in the DAPs process has been recognised, and the role of an independent quality body enshrined in legislation. These are the safeguards the sector was looking for, and this is the reason why Universities UK and GuildHE have now joined us in offering their full and unqualified support for the amended Higher Education and Research Bill. There can be no more doubt. This is the Bill the higher education sector needs, and it needs it now. It is time for Parliament to show courage and choose the path to the future.